Due to the radical shift in the economy, financial institutions have suffered significant portfolio losses in recent years, primarily due to an inability to accurately forecast bad payment rates. Specifically, many lack advanced analytic forecasting tools that successfully associate macroeconomic factors with delinquency rates. For example, let’s suppose it is June 2008. An auto lender accepts loans with a score of 695 or higher. The most recent bad rate projections show a 0.51% bad rate for the accepted population which would equate to a projected loss of $36MM. The actual bad rate ends up being 0.98% for these 2008 loans. For 1 million loans, with an average write off balance of $7,000, and all the bad loans go to write-off then the actual write-off balance would be $68MM. And, if the lender set risk policy based on an older bad rate projection, the error would be even larger. This clearly illustrates that economic changes and associated changes in consumer behavior have not been accommodated and managed accurately; otherwise these unexpected – and devastating — losses could have been avoided. Did the problems result from poor loss-forecasting techniques, or good loss forecasting overtaken by a bad economy? However good the loss forecasting techniques are for projecting losses associated with a portfolio of booked accounts, inaccuracy will result when the quality of booked accounts is not understood. We must look at actual risk management practices to see whether accurate, informed, acquisition decisions are being made, to allow banks to manage their portfolios effectively. 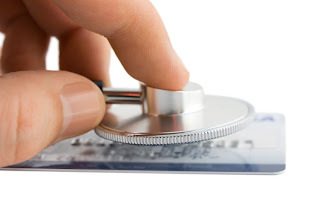 Credit scores are used as a primary tool for deciding on whether to give someone credit, and may be used to help determine interest rate and amount of credit given. However, the question we need to ask is, do they cope well with a rapidly changing environment? The traditional approach to risk management sets accept strategies according to the projected performance of each applicant, and interest rates reflect the risk (bad rate) associated with their credit score, resulting in losses like the example above. Take a look Figure 1. 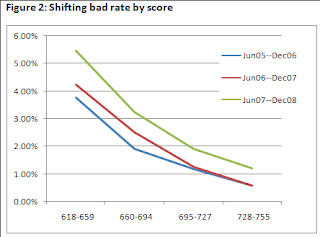 It shows the bad rate on auto loans for each score range for three application points in time – June 05, 06 and 07. The bad rate is defined to be the percentage of auto loans that go to 90+ days past due within 18 months of opening. 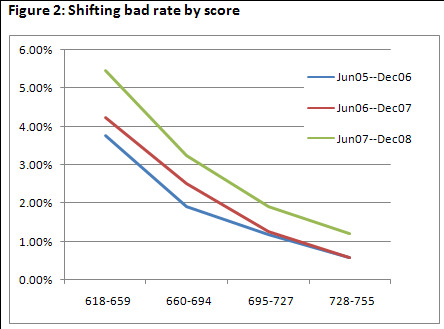 We observe a year-on-year increase in the bad rate for the same score cut-off strategy. Despite the changing bad rate, the performance of the score, measured by its ability to separate out good payers from bad payers, changes very little. One commonly used scorecard had a change in the KS statistic of less than 2% across this period. The KS statistic is a measure of how well a score separates good from bad payers, or how well actual data fits to the model (click here or here for more resources on KS Tests). This shows the ability of a scorecard model to rank order risk is separate to its’ ability to predict bad rate at a given score. If a scorecard continues to rank order well, why is a changing bad rate to score relationship a problem for lenders? It would not be a problem if they had perfect foresight on the bad rate associated with a score based decision being made when the decision is being made. 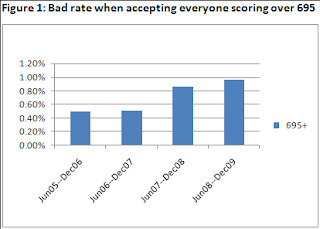 Figure 2 shows the changing bad rate to score relationship across time, and was derived after time had passed and we could observe what the resulting bad rate actually was. Wrong decisions are made as a result of not having an accurate forward looking view. When decisions were being made in June 2007, the bad rate lenders were expecting was the lower bad rate given in the blue line of the chart. However, those loans actually had the much higher bad rate associated with the green line. The consequences of this inaccurate information can be major. The consequences of an unexpectedly low bad rate may not always be as dire, but pricing will have been wrong, and opportunity for profitable business will have been lost. In part two of this series we will discuss how the use of macroeconomic data can enhance the accuracy of bad payment rate forecasts. If you are interested in a monthly e-mails about blog updates, sign up for our newsletter. Click here to find out more about Equifax’s advanced analytic insights.